There are real reasons to worry about President Donald Trump's foreign policy, including his casual belligerence toward Iran and North Korea and his failure to rethink U.S. alliances with Saudi Arabia and Israel, but The New York Times obsesses on Trump's willingness to work with Russia. On Saturday, the Times devoted most of its op-ed page to the Times' favorite conspiracy theory, that Trump is Vladimir Putin's "Manchurian candidate" though evidence continues to be lacking. 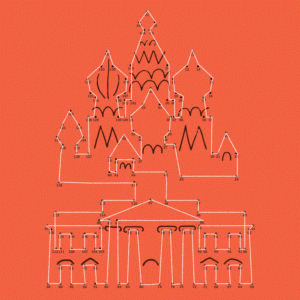 The op-ed package combined a "What to Ask About Russian Hacking" article by Louise Mensch, a former Conservative member of the British Parliament who now works for Rupert Murdoch's News Corporation, and a connect-the-dots graphic that when filled out shows the Kremlin sitting atop the White House. But the featured article actually revealed how flimsy and wacky the Times' conspiracy theory is. Usually, an investigation doesn't begin until there is specific evidence of a crime. For instance, the investigative articles that I have written over the years have always had information from insiders about how the misconduct had occurred before a single word was published. In the early 1990s, for the investigation that I conducted for PBS "Frontline" into the so-called "October Surprise" case -- whether Ronald Reagan's campaign colluded with Iranians and others to sabotage President Jimmy Carter's negotiations to free 52 American hostages in 1980 -- we had some two dozen people providing information about those contacts from multiple perspectives -- including from the U.S., Iran, Israel and Europe -- before we aired the allegations. We didn't base our documentary on the suspicious circumstance that the Iranians held back the hostages until after Ronald Reagan was inaugurated President on Jan. 20, 1981, or on the point that Iran and the Republicans had motives to sandbag Carter. We didn't casually throw out the names of a bunch of people who might have committed treason. When we broadcast the documentary in April 1991, there was a strong evidentiary case of the Reagan's campaign guilt -- and even then we were highly circumspect in how we presented the story. Ultimately, the 1980 "October Surprise" case came down to whether you believed the Republican denials or the two dozen or so witnesses who described how this operation was carried out with the help of the Israeli government, French intelligence, and former and current CIA officers -- along with former CIA Director George H.W. 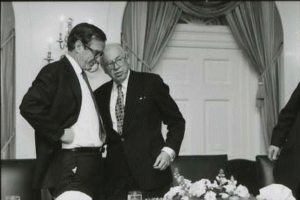 Bush and future CIA Director William Casey. In the end, Official Washington was never willing to accept that the beloved Ronald Reagan could have done something as dastardly as conspire with Iranians to delay the release of 52 American hostages. It didn't matter what the evidence was or that Reagan quickly approved arms shipments to Iran via Israel in 1981, a prequel to the later Iran-Contra arms-for-hostages scandal of 1985-86. By contrast, what the current "Russia Owns Trump" allegations are completely lacking is an insider who describes any nefarious collusion between the Trump campaign and Russia to arrange the Kremlin's help in defeating Hillary Clinton and electing Donald Trump. What we do have is President Barack Obama's outgoing intelligence chiefs putting out evidence-free "assessments" that Russia was responsible for the "hacking" and the publicizing of two batches of Democratic emails, one from the Democratic National Committee and one from Clinton's campaign chairman John Podesta. The DNC emails revealed that top Democratic Party officials had violated their duty to remain neutral during the primaries and instead tilted the playing field in favor of Hillary Clinton and against Sen. Bernie Sanders. The Podesta emails exposed the contents of Clinton's paid speeches to Wall Street, which she was trying to hide from voters, as well as some pay-to-play features of the Clinton Foundation.